You’re about to walk left-hand first everywhere you go. You’ll also start touching your face excessively when you talk to people. But, most importantly, you’re going to be beyond excited to get started with your wedding plans. Not only do I speak as a certified wedding planner. But I also speak from experience. When I got engaged, I literally couldn’t wait to get started planning. This is partly due to the fact that Rob and I got engaged right before he spent the summer in Spain. It was the first time this attached-at-the-hip couple was going to be a part for any length of time. As a result, we locked down some of the essentials before he left since we planned on getting married the next summer. (Nothing could come in the way of football and hunting season!) That first few weeks of engagement consisted of booking a venue, securing a wedding date, and pinning more wedding pins than I thought possible. Looking back, I somewhat regret rushing into a lot of the plans that we made out of excitement in the beginning. Don’t get me wrong, I absolutely loved every detail of our wedding. It was truly beautiful and the best day of my life. However, Rob and I actually talked about it recently that, if we could do it all over again, we think our wedding day would look a lot different now. While we have only been married a year and a half, I think that’s natural as you mature and grow with one another. Not to mention, being around weddings for a career, it’s hard not to imagine your own wedding day in a million different ways on the daily. Now, I need to clarify to all you that are reading this. We did actually have these must-have conversations before we started planning our wedding. Heck, I think we had a lot of these conversations before we even got engaged. While we had these conversations, the only thing we wish we would have done is just to have taken longer to consider our options and what we could have done. The point I’m trying to make is that so many other couples don’t communicate about this. However, unfortunately, a lot of times I see couples so excited about planning their weddings that they fail to even really plan at all. (As a planner, I have a hard time even imagining this!) When it comes to planning your wedding, communication is key. In fact, communication is key to any relationship in general. These must-have conversations really serve as the foundation behind everything you’ll decide on over the next year or so. Not only will having these conversations make you both plan towards a wedding day that you’ve dreamed about. But, it will actually help decisions to flow so much easier throughout your whole planning process. This is a huge and all encompassing question that should be among one of the first you have before you start making plans for your wedding. You should be asking each other about your feelings on the following details. Location – Do you want a local affair or destination wedding? Also, if your families are from different areas, where will you guys decide to get married? With my family from north Texas and Rob’s family from south Texas, we decided to get married in the city we met and lived in at the time. It was somewhat of a central location for everyone to meet in the middle! Time of Year – Have you been dreaming of a cozy, intimate fall or winter wedding or a bright and airy summer wedding outdoors? Size – How big of a wedding do you want? How many people do you want on your guest list? 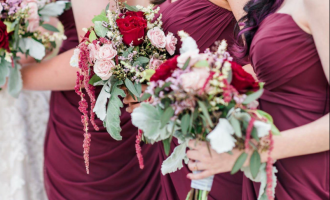 Aesthetic – What is the look and feel that you want your wedding day to have? Have you been dreaming of a luxurious ballroom wedding? Or does a more cozy and intimate gathering suit you both better? Expectations – What expectations do you each have about your wedding day? When it comes to planning your wedding, your budget is the necessary evil. It’s like the four letter word that your grandma washed your mouth out for with a bar of soap. While a wedding budget is extremely necessary to make sure you don’t go into debt over your wedding, we’d all prefer to play without it. It’s important to make sure that you rationalize the wedding you dream of having with the one that you can actually afford. Sit down and have a realistic conversation about how much you’d like to spend on your wedding before you start planning. I even suggest that couples break it down by category and vendor. (Another reason to hire a wedding planner – they do this for you!) Not only will it make planning easier. But, it’ll save you from the heartache later of having to sacrifice something you really care about because you didn’t plan ahead in another area. READ ALSO: Should You Hire a Wedding Planner? As you sit down to discuss your budget, it’s also important to discuss who is providing the funds. While more and more couples are starting to pay for their own weddings, traditionally the parents of the bride paid for the wedding and the parents of the groom paid for the rehearsal dinner and honeymoon. I get it. It’s always awkward talking about money. But, it’s essential to discuss early on who is expected to pay for what throughout the wedding planning process. (Especially if it’s the parents paying!) It will allow everyone to be on the same page throughout the planning process. Not to mention, it will save the drama that would have been inevitable later. It’s sad to say that some families forget that the wedding is about the couple. When you discuss the financial situation behind your wedding, it’s also important to discuss any family boundaries. Are there strings attached with so-and-so paying for ___? Meaning, are they going to expect being an influential part of the decision making process? Discussing family boundaries ahead of time will help you and your fiancé to face decisions (and any family drama) easier as a team. What elements of your big day do you care about most? A lot of brides get frustrated because their fiancé isn’t as interested in helping with the wedding planning. But, did you notice how I started that sentence? That means you’re not alone! You know what else? It’s okay! Just because your fiancé is not interested in linen colors, floral arrangements, and stationary doesn’t mean that your future together is doomed. Just remember that guys haven’t exactly been dreaming about the wedding day like we have our whole lives. Asking him what elements of your big day he cares about will show him how much you care about him. It’s like what I always say about Rob. He didn’t care about much when it came to design with our wedding (and now the design of our home!) So when he does care about something and wants to have an opinion, I want him to have that and be happy. I hope these conversations serve you well as you begin to plan the beginning of your forever together. Very good tips! Especially the family boundaries part! It’s amazing to me how many family members might be willing to contribute to your wedding, but some really do expect something in return! Great article! Thanks, Alyssa! I definitely have seen it a lot (and it honestly makes me really sad!) It is really a serious conversation that I think all couples need to have before they plan their wedding. I think it saves from so much potential drama in the long-run. Yes to all of these. I feel like we did a pretty good job of planning our wedding, for two 19 year olds. Looking back 8 years later there’s not much I would change, other than forking it out for a good video. Ours didn’t turn out very well and we almost didn’t get it back at all, but at the time we were looking at price as our primary decision factor. I also wish Pinterest and Instagram had been around back then! I would have been inspired to do more myself, and we could have had a hashtag lol. This made me reminisce about all things wedding! It was 6 years ago and I wouldn’t change a lot about it. Who’s paying for what was very stressful at the time. Like I mentioned in the post, I think the only reason we’d do it differently now is just because I’m in the industry and have seen so much of what we could have done! I loved our wedding day though. It was perfect. 🙂 I do agree that financials can be a big stress – that’s why I always suggest talking about it. While it may be awkward, I think it’s best to be open about it! Love this post! 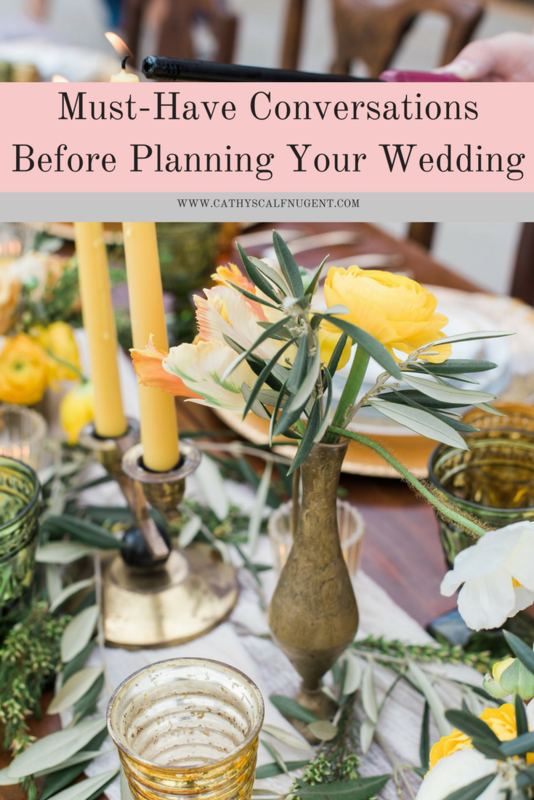 These are wonderful tips and very important conversations that need to be had prior to wedding planning. YES! I got married 6 years ago, and all of this still rings (heh, get it?!) true! Amen, girl friend! 🙂 I’m so glad that you agree! Great advice to make sure you and your fiance are on the same page from the start!